The WCMG won the Environment and Heritage award as well as the Supreme Award at the Trust Power Community Awards in September 2014. 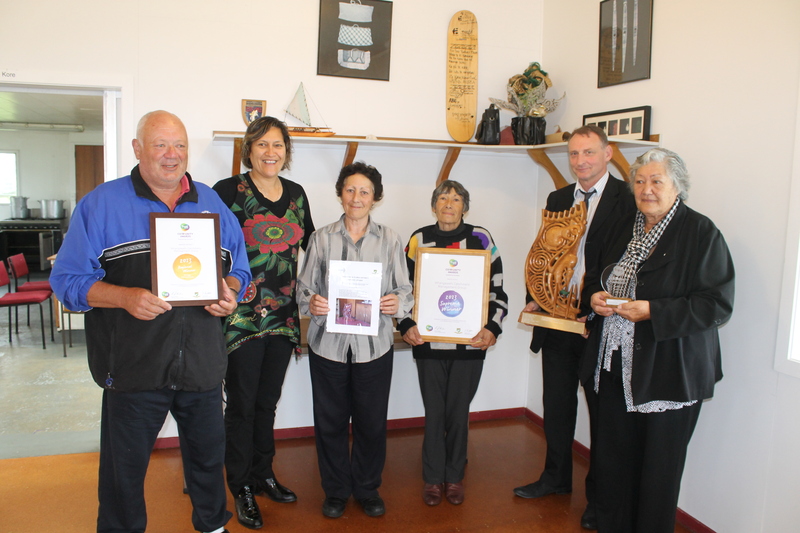 These Awards acknowledge the dedication and commitment of the Whangawehi community and volunteers since 2010. The group will be competing in March 2014 for the finals in Invercargill where a short film will be presented as part of the competition (search Whangawehi on youtube). Meka Whaitiri, Labour MP, for Ikaroa Rawhiti came to congratulate the group and learn more about our successful project. Meka underlined the fact that Maori have got deep connections and interests in fresh water and there is a need to build Indigenous expertise in that field. The group has been working with Nicky O’Brien, Principal at Te Mahia School, since March 2013, looking at integrating the transfer of traditional knowledge within the Enviro School network. A curriculum is in place and a series of 15 practical workshops have already started. These workshops are run by skilled local Kuia and Kaumatua around matauranga Maori themes: Tikanga, native plants, rongoa, water and fish monitoring, bird watching, weaving etc. This unique template has already generated a lot of interest and the school has been offered the support from WWF- New Zealand, Department of Conservation, Fish and Game, HBRC and the National Aquarium of NZ through the Fresh Water Education Programme. Our water monitoring team has been monitoring the waterways5 times per year since March 2013 and organises workshops for the community. On the 12th of December, the team took a group of students from Te Mahia school for a walk along a nearby creek to assess the water quality and do some fish monitoring. This workshop gave the students the opportunity to learn how to measure and compare water quality in different habitats. A hinaki set the night before gave the students a lot of fun and they were most impressed when they realised that the eels caught and released were the rare and endangered Long Fin eels. On the 25th of January, the WCMG organised its first community day to present the work done over the previous year and acknowledge the support received from funders, agencies and partners. The day ended up at the Whangawehi bridge with the unveiling of a community sign showcasing the group’s goals and aspirations. The group’s success relies so far on a huge commitment and dedication from the community, a strong Marae leadership, a great level of support and financial commitment from funding partners’ and a remarkable buy in from leading farmers and Forestry Company. A DVD is available for those who haven’t been able to attend. The first restoration programme is progressing on Pat and Sue O’Brien’s farm with the construction of a 1.5 km fence well underway. Weed control will be undertaken in March prior to the establishment of a minimum of 6000 native plants in July 2014. We will keep you posted. The first big musters will start in the end of February and the ground control will follow on a weekly or fortnightly basis. Landowners willing to join the scheme will be contacted by Colin Pirie prior to that for access arrangements in the next few weeks. An archaeological assessment for the lower part of the catchment was done in September 2013. The second stage of this cultural survey will take place in March 2014 with the spiritual assessment of the same area by a Matakite. On Saturday the 22d of February the group went to Tutira, to visit several conservation initiatives developed as a partnership between Ngati Pauhauwera, EcoEd, Poutiri Ao o Tane and DOC. The first stop was at the Kiwi crèche, a predator free sanctuary of 32 ha completely fenced off where young kiwis are given the chance to grow in a safe environment until they are released. The group drove up one of the local Maunga to reach the Petrel site, an other predator free area where young petrel have been reintroduced in reconstituted burrows with the hope that they will come back for nesting in 5 years time. The local iwi is trying to bring back these sea birds as they are part of their identity “the roaring mountains “Maungaharuru.”. This trip gave the Whangawehi group some ideas on what could be a possible next step in their restoration programme.